Trial By Sapphire: "Smile, damn it." My hunt for a dance studio has been disappointing. It seems as though dance studios here only cater to ballroom couples and senior citizens. With the very active performing arts community I'm hearing about in Houston, I'm shocked that it's so hard to find an adult studio with a varied class schedule. No, pole dance aerobics does not count (though you'd be surprised how many of those I've found). I'm looking for the more traditional classes like jazz, ballet, and hip hop. In my many Google searches, an enormous amount of yoga/pilates studios came up. I had never taken a formal class, but it seemed like my next best option. I narrowed the list down by class schedule and price, and then I came across Yoga Month! What better way to try something out than with free events? Yesterday marked my first official yoga experience for Free Day of Yoga Houston at none other than my favorite neighborhood spot, Menil Park! It was meant to be! New activity, just a few blocks from home, sunny and breezy, and completely free. I went, I met a few people, I sweat the sweet life out of me, fell in love with it, and left wanting more. 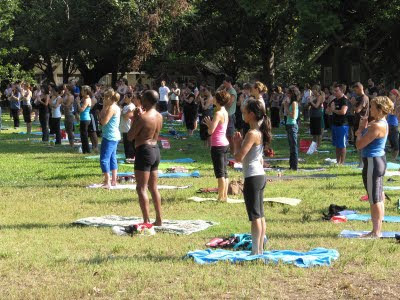 There were about 150 yoga mats and towels sprawled across the grass with the sounds of chattering yogis anxoiusly looking through small swag bags of Luna bars, coupons, and free passes to nearby studios. And then it was one hour of one voice through a microphone leading the class, the breeze, a lot of chirping birds, fun music. I did my best, and I must say that I don't think I stood out, thanks to my dance background! Raye Lynn Rath's voice was so soothing yet energetic. She was focused but still made it fun. With encouragement, she said in her ever-silky voice, "Really open yourself up and reach. And remember to smile. (pause... and then continuing in her gentle tone...) Smile, damn it." We couldn't help but smile after that! It became a running joke that only garnered more laughter every time. Yes, that's me in the gray tank top! Wow, that makes me want to try yoga now! So happy to see you doing something good for your body and soul, Linz. So glad you're doing well in Yoga. I began doing Yoga the same time I started doing Pilates. Sometimes I was doing back-to-back Zumba & yoga! But my "old" body can't handle the "happy body" state I want it to experience, so for now it's just Pilates until I can build enough core strength to carry me through the Yoga moves! Well, Pilates & Zumba & Xtend Barre & Agility! Miss you darlin'!! !